If there is one thing my dogs love, it is treats and dental chews! Zuke’s just happens to be one of their favorites and they are at the top of my favorites list too! 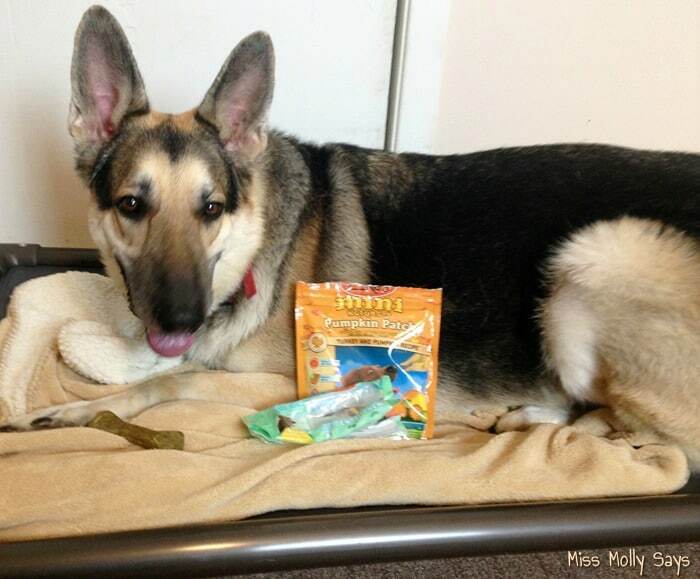 Their treats are of the highest quality with natural ingredients that I can trust. Well, this year Zuke’s has introduced flavors of the season – Pumpkin Patch Mini Naturals, with turkey and pumpkin, AND Minty Fresh Z-Bones to clean their teeth and freshen their breath after they eat! They didn’t want our fur kids to be left out of the holidays! Sounds like a fun company right? Well, if you haven’t met them yet, let me introduce you to them and then we will check out these new fun holiday treats! Located in Durango, Colorado, Zuke’s is a leader in the natural pet treat category. Named after founder Patrick Meiering’s beloved Labrador Retriever, Zuke’s has been powered by passionate pet lovers for 20 years. The Zuke’s team is driven by the joy that comes from exploring and adventuring with their dogs, and the pursuit of a healthier life that makes pets and people happier. Creating treats with only the finest natural ingredients and no harsh additives or preservatives has been a priority at Zuke’s since day one. All of Zuke’s products, with the exception of the new Genuine Jerky featuring 100% grass-fed beef from New Zealand, are made in the USA. The company’s unwavering commitment to product purity and quality helped Zuke’s become a successful, sustainable, and philanthropic business. The Pumpkin Patch Mini Naturals are cute little treats shaped like real pumpkins! These are tasty, low calorie, moist treats and I love using them for training! 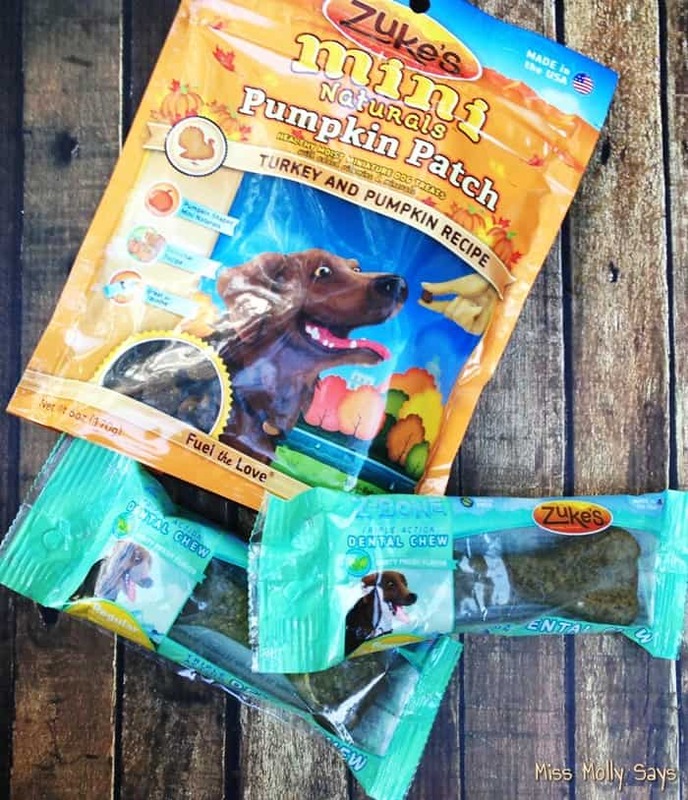 With the flavors of the holidays, turkey and pumpkin, I believe my dogs would stand on their head for these treats! They love them that much! I love them because they are free of harsh additives, preservatives, and common allergens like wheat, corn and soy. And, of course they are made in the USA. I love when I can give my pups something that cleans their teeth AND freshens their breath at the same time! While all the Z-Bones are amazing, the Minty Fresh Z-Bones are a triple-action dental chew designed to naturally freshen breath, polish teeth and maintain healthy gums without the use of wheat gluten, cornstarch or synthetic chlorophyll. Cleans teeth: They have the ideal texture, which helps scrape and polish with every bite! Freshens Breath: With spearmint and fennel, they help clean and freshen your dogs mouth! Supports Healthy Digestion: They support digestion and freshen breath from the inside out through through alfafa, parsley and rosemary. These tasty Z-Bones dental chews contain NO harsh additives, preservatives, and are free of common allergens like wheat, corn and soy. They are also grain free! And, of course the Z-Bones are made in the USA! 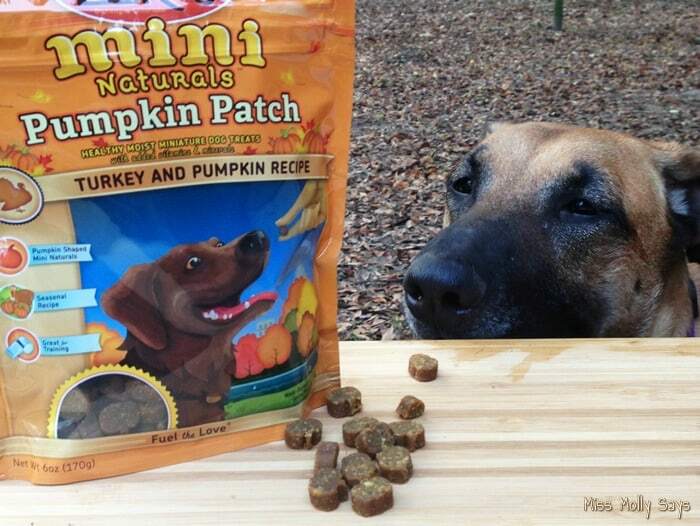 All my dogs LOVED both the Zuke’s Mini Naturals Pumpkin Patch dog treats and the Minty Fresh Zuke’s Triple Action Chews! 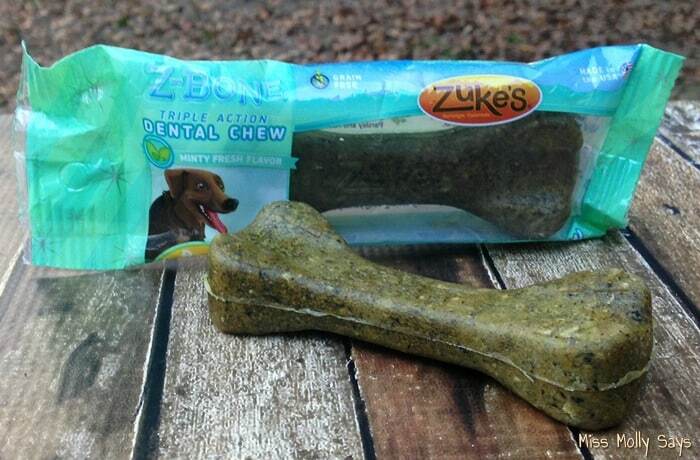 What a great stocking stuffer the Zuke’s dog treats and dental chews would make! You can find the seasonal Zuke’s Minty Fresh Z-Bones and Zuke’s Mini Naturals Pumpkin Patch treats at retailers and online for a limited time and while supplies last. Use their handy store locator to find a store near you. And, did you know that Zuke’s donates a portion of all sales to The Dog and Cat Cancer Fund (DCCF)? I love that! Just another reason to love Zuke’s! Zuke’s Treats and Chews are featured on Miss Molly Says 2015 Christmas Gift Guide! Visit the gift guide to find more PAWSOME gift ideas! Thank u for the review, the treats sound good with their limited and quality ingredients! These sound like something my Pom would love! Zuke’s dog treats are the only ones my fur babies can have. My dogs have allergies and Zukes makes the best, high quality and tasteful treats my dogs love the most. Love what Miss Molly Says!! My dog likes these and the benefit of cleaning teeth and freshening her breath is great and much needed. Sorcha loves this brand so much, thank you for sharing this review. I entered your giveaway with an “Amie De” Facebook account. My dog grew up on Zuke’s treats! Se loves them all. I like that these are made in the USA! Your dogs have a great job, getting to product test! I like that these treats are small, so suitable for any size dog. Nice! My dog loves Zukes! I sure would like to get this for my buddy. The mini pumpkin treats are great for training since they are bite size, or when your dog think she needs a treat every time you walk in the kitchen lol. Great Review! Zukes makes great treat. My pup would love to try the dental chews. They sound great. I love reading reviews before I buy for my dogs. Thanks you for all your reviews. Love that they have seasonal flavors. My dogs get bored with their treats so new flavors renew their interest! thank you for this review, sounds like our two dogs would LOVE these products! my 3 gals love zuke’s. they like the treats and not the bones. the bones are a little hard since they are small. i was worried abt them cracking a tooth…but they love the little zuke treats, and chewy treats. i was disappointed that zukes sold their company to a big name food company a yr ago or so. i know some of the independent dog stores stopped carrying their products b/c of this. I am always looking for new and healthy dog treats. These sound great. I am very particular about what I feed my fur man. Each and every time I consider a purchase, I always check to make sure of where the product is made. I love that Zuke’s products are USA made. I feel very comfortable with a company like them who strive to produce only the best! I recently found Z bones and I was so excited because I just noticed plaque on my dogs teeth. I used to give her greenies but she is now on a grain free diet so a lot of her treats are now zukes. I got a bag of z bones and she loves them =D It makes me happy when I find a treat that my dog loves and it is also healthy for her. Thanks for the review. I would like to have my dogs try these & see if they like them. First I would like to say that your Shepard is absolutely magnificent. I’m always looking for bones that would help keep her teeth clean. I love that not only does your bones help keep their teeth clean, it helps with their breath and their digestion. Zukes treats are some of my dogs’ favorite treats. I can trust the ingredients and the manufacturing process too. My daughters dogs love trying new snacks. They love the minty greens. These treats sound like something my dogs would love! I love their treats and this is what I give my dogs for treats. I have never tried their dental bones though but would love to try them. My dogs love them and I like how they are all natural.